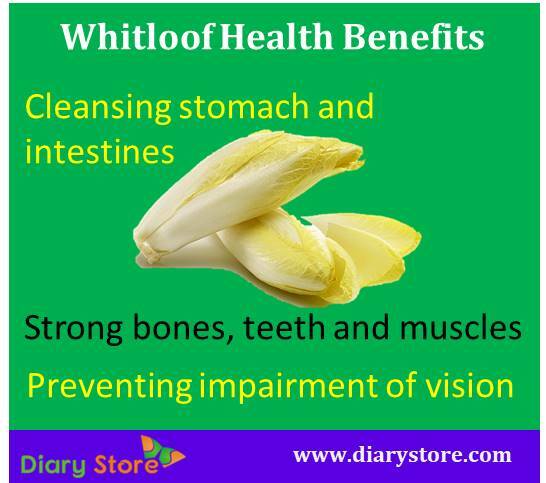 Whitloof, or whitlof, is also known by other names Belgian Endive or simply Endive. Whitloof is the common name by which it is more popular in United States and Dutch. The plant is called chicory in United Kingdom. There is a belief that the vegetable had been in use since 16th century in Egypt or Indonesia. However, available evidences reveal that whitloof was accidentally discovered in Belgium by a farmer Jan Lammers in 1830. When he tried to store chicory roots for the purpose of drying and grinding as a substitute for coffee beans (as was the practice in those days), he found that some of the roots he left inadvertently in the dark, moist and claggy storehouse developed leafy foliage which tasted tangy and mildly bitter, yet toothsome. 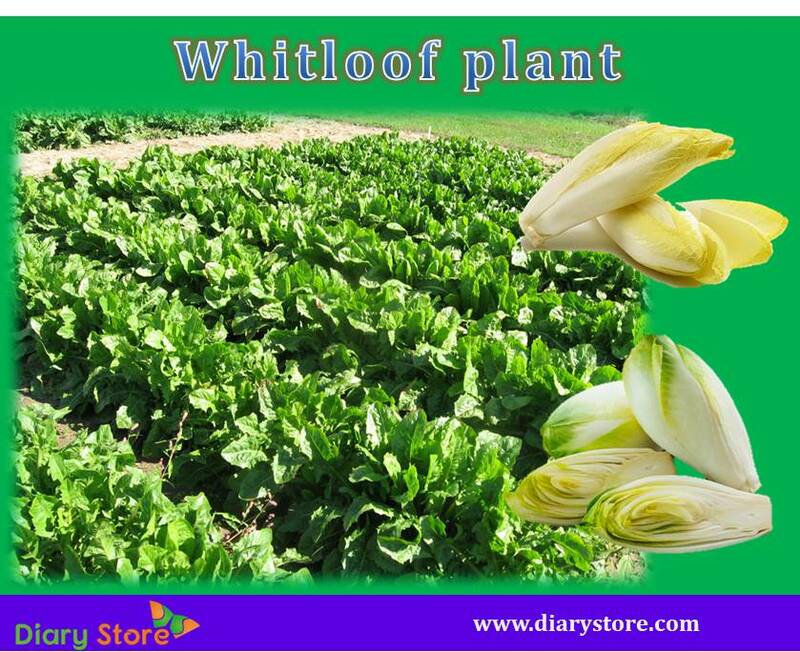 Since then, the whitloof began to be cultivated on large scale and the vegetable won world-wide attention. Cultivation of whitloof was steadily on the increase across the globe and the demand for the horticultural product went upward to the extent of selling it overseas by intercontinental trade. Belgian endive is mostly grown underground, devoid of sunlight, for its stuffy curly leaves. It is also considered as chicory of a broad leafed category grown by blanching. Endive is usually is served along with lettuce to enrich the taste of green salad. The endive leaves can be stir-fried, grilled, sautéed in olive oil with a drizzle of lemon juice or used as a substitute for shreds of cabbage. Being a bye-product of chicory plant, its use has been detected as coffee extender. The leafy foliage rather vaguely resembles unblossomed lotus flower buds, but when cut open it looks like tiny pieces of chopped cabbage. The unfurled leaf shoots grow up into broad green leaves. Chicory roots are sown into the garden soil in a shallow pit. The top surface of the sown roots is covered with a tightly pressed layer of 6 – 8 inch earth or straw. The soil should be sufficiently watered. Small heads in white or mild yellow colour begin to grow from the top of each root because they are raised in darkness or semi-darkness, without being fully exposed to sunlight. Leaves sprout from the head of roots due to the pressure of soil or straw above them. This method is called “growing with earth coverage”. Alternatively, chicory roots are dibbed in big flower pots in a soil rich mulched with compost or organic manure. Initially, white or light green tops begin to peek up from roots and eventually develop into broad crinkled green leaves. This type of growing the plant in home yard is called “Growing without earth coverage”. The percentage Daily Values are to be considered vis-à-vis a diet of 2000 calories. Fiber content present in whitloof has a property of cleansing stomach and intestines and proper evacuation of bowels. Constipation is reduced to a great extent. Oral intake of fiber gives a sense of fullness in stomach lessening the total quantity of food consumed in a day which would help in curing obesity. Provitamin A is converted into vitamin A which is helpful in preventing impairment of vision and maintaining the health of skin and tissues. Intibina, the substance responsible for bitter taste of the vegetable, is capable of emptying gall bladder and improving the functioning of liver. A carbohydrate called inulin present in endives is a stimulator of hunger and a good appetizer. Food eaten when hungry is likely to be digested fully well. Folates in whitloof can help in preventing neural defects of foetus and hence whitloof is recommended in the regular diet of pregnant women. Children too are encouraged to eat endives since folates are also needed for proper growth in kids. Vitamin C acts as a powerful antioxidant which is necessary in synthesis of collagen needed for strong bones, teeth and muscles. Vitamin C is also helpful in fighting against infections causing common cold and snot-seeping nostrils. Since whitloof is a low calorie diet, its consumption does not hike the levels of fats in the body. If the nutritive ingredients of the vegetable are to be properly utilized for improving health, a qualified physician should be consulted for finding out the correct quantity and frequency of intake (per week) in the food, in accordance with the requirement of any individual taking into account the person’s health status.